This beautifully designed set of 12 two-sided cards, plus a cover card with the book cover logo. Each two-sided card contains a description of the Power and an affirmation to claim the Power on one side, and an affirmation to call the Power forth at its highest, most elevated level, along with a mini-poster on the other side. 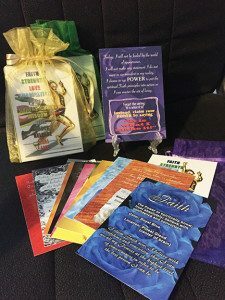 These cards are perfect for daily inspiration, use in meditation, and training guides for better understanding the 12 Powers. They come packaged in a colorful net bag with a clear plastic easel for displaying the cards.